The heavenly sweet fragrance and flavor of the fresh subtropical lychee fruit with a kick of an vodka is simply amazing. 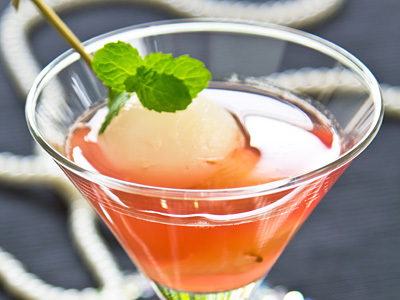 The lychee martini prepared with this recipe smells and tastes like lychee that will conjure up images of exotic and far away tropical places while you slowly sip it. Add all liquid ingredients in cocktail shaker filled with ice. Shake thoroughly for 20-25 seconds. Put strainer cap on cocktail shaker and pour mixed drink into chilled martini glass. Garnish with peeled and seeded lychees and serve. Lychee has a very short season of 7 weeks. Make best use of it when it is in the season. If fresh ones are not available, then use frozen ones. To make its fresh juice, blend peeled and seeded lychees with sugar syrup and lemon juice in a blender until smooth. Sieve it through a fine-mesh, press hard on solids to get all flavors out of it. Increase the quantity of vodka to 45 ml (1½ oz) for more potent cocktail. Add a splash of orange liqueur for nice complimenting citrus flavor. 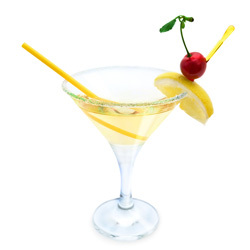 Add 15 ml (1/2 oz) simple syrup to make sweeter martini.